Dylan's greatest lovesongs, elegantly arranged and beautifully sung. 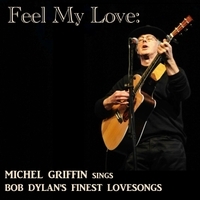 As you listen to Michel Griffin's accomplished new album, you wonder why someone hadn't already had the idea of devoting a CD to a collection of Dylan's lovesongs. After all, the new Nobel prize winner is an old hand at penning eloquent songs on the subject of Love. One could always argue over which titles to include (this selection seems to favour his earlier work), but there's no doubt that this is a beautifully produced set. Griffin avoids the trap of serving up slavish copies of the originals, instead daring to envisage novel arrangements - witness the gorgeously slow and heartfelt rendering of I want You, the extended version of Where Are You Tonight? (Journey Through Dark Heat) and the elegant treatment of If You See Her, Say Hello. And Griffin has his own voice too. Unlike many, who try and imitate Dylan's nasal sardonic delivery, Michel uses his own velvety smoky voice to bring new life to the familiar lyrics, making us hear the songs in a new way. And if there is any justification for coming out with a cover, it has to be that the cover uncovers new facets of the original. Many of Dylan's most popular tracks are here, including Girl from the North Country, Don't Think Twice, It's Alright, which was recorded live, and, of course, Make You Feel My Love, which is arranged for three guitars and a saxophone and sung with such feeling that it'll give you goosebumps. He’s been writing songs ever since. He has performed regularly on BBC radio (where one of his songs was a Pick of the Week) and his career has taken him all over the world, with spells living in Paris, New York and Switzerland. He finally settled in the Lot valley in SW France, where he runs the critically acclaimed Cahors Folk Club. He performs at venues all over the area, a tune of his was featured in the American film Married Men, and this is his 6th CD. I can't stop listening to this! Griffin's rendition of MAKE YOU FEEL MY LOVE just kills. Love his voice--he seems to wrap it around Dylan's lyrics so effortlessly, like these were songs he was meant to sing. My husband got me this for Valentine's Day--I'm loving this. The album's like a love story in song, and Michel's voice just takes me by the hand on the journey. Heaven.